Claire Cunningham is a performer and creator of multi-disciplinary performance based in Glasgow, Scotland and a current Factory Artist with Tanzhaus nrw in Düsseldorf, Germany and Associate Artist in The Place, London. 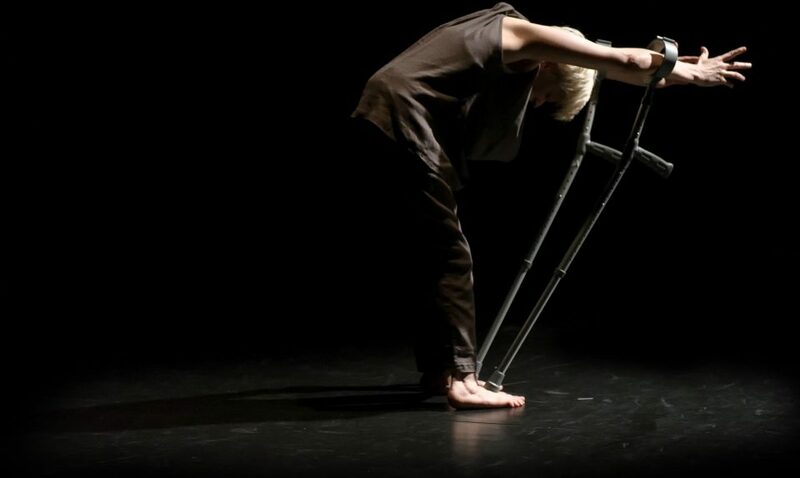 One of the UK’s most acclaimed and internationally renowned disabled artists, Cunningham’s work is often rooted in the study and use/misuse of her crutches and the exploration of the potential of her own specific physicality with a conscious rejection of traditional dance techniques (developed for non-disabled bodies). This runs alongside a deep interest in the lived experience of disability and its implications not only as a choreographer but also in terms of societal notions of knowledge, value, connection and interdependence. A self-identifying disabled artist, Cunningham’s work combines multiple art forms and ranges from the intimate solo show ME (Mobile/Evolution) (2009), to the large ensemble work 12 made for Candoco Dance Company. In 2014 she created a new solo: Give Me a Reason to Live, inspired by the work of Dutch medieval painter Hieronymus Bosch and the role of beggars/cripples in his work, and the full length show Guide Gods, looking at the perspectives of the major Faith traditions towards the issue of disability. She is a former Artist-in–Residence at the Women of the World Festival at the Southbank, London and of the Ulster Bank Belfast Festival at Queens. In 2016 she was Artist in Residence with Perth International Arts Festival, Australia and Associate Artist at Tramway, Glasgow. Claire is currently touring The Way You Look (at me) Tonight, a duet with Jess Curtis. Claire Cunningham’s work is initially rooted in the use/misuse, study and distortion of crutches – Cunningham’s metier. Through these objects she not only engages physically with the world, exploring the potentiality of her specific physicality as a disabled individual, crafting a unique vocabulary which aims to challenge conventions around virtuosity, classical aesthetic and dance, but are also her means to relate and connect to the world as an artist. She aims within her work to find ever-increasing levels of honesty – both as a live performer and in the base material. It is often biographical, exploring deep personal questions but with wide-ranging and indeed universal resonances. She is interested in non-normative bodies and keen to highlight the enrichment to be gained in contemporary performance, especially dance, by embracing this. By extension she is also driven to make work that will attract those often disenfranchised from watching contemporary dance due to the conventional body aesthetics or because of the seeming abstractness of dance. Her interest in combining artforms stems from this intention. Cunningham looks to make work that embraces multiple artforms holistically rather than in ‘layers’, with a belief in the idea of a ’rounded performer’ rather than the divisions of dancer, actor, singer, etc. Her work has escalated in scale both physically and conceptually in recent years as she works to expand away from solo work with a drive to work more collaboratively. Overall she seeks to make work that is challenging, riddled with dark humour, but most importantly, engaging.